There has to be a better way... Direct, clickable links? Does anyone have any ideas? What are you using the Mind-Maps for in your process? Technically, that is just doing a search and displaying a best match note if there is one, but that is all you need, as long as you don't rename the note. That macro resides inside a "Available in these applications: The Archive" macro group and allows me to just select a note in the notes list and then hit ⌘0 to copy the proper link to the clipboard. From there, you can paste the link wherever you want. I primarily created the macro so I could link to TA notes from within tasks in OmniFocus. Hi, @Basil - that's really helpful. Thank you. I'll try what you suggest. @ctietze - the mindmap works as a sort of 'pre-outline' for the novel. It's the result of brainstorming everything that's come up in my thinking and research about the project, sorted into themes and narrative streams, then linked, hopefully, soon, to relevant notes in my archive. From the combination of these two comes a more formal outline using the cork board function in Scrivener. Then, a first draft. 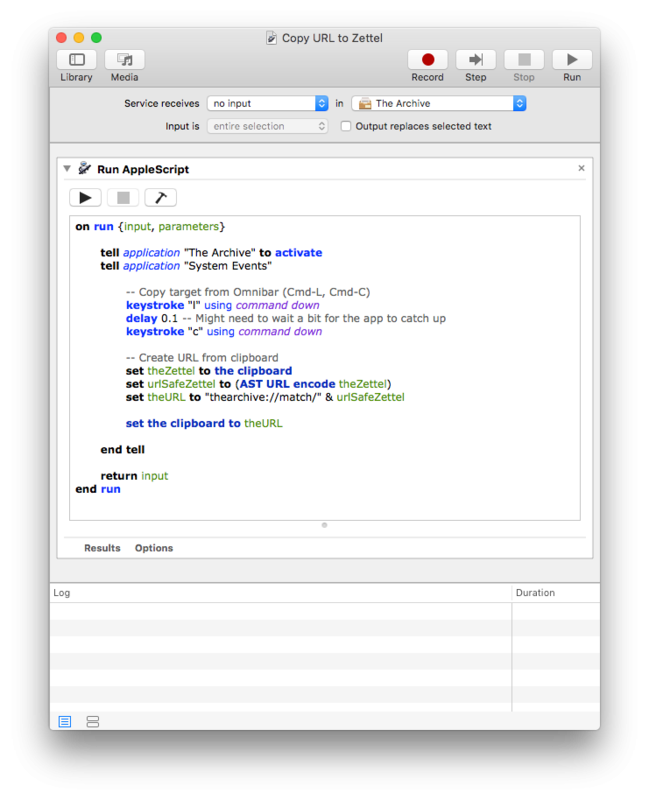 Sorry, one more question: would the macro work in something like Automator? I used Keyboard Maestro, which is an insanely good automation application and one of my favorite pieces of Mac software. The nice thing about Keyboard Maestro is that, in contrast to other automation applications, you can do a lot of things with it, even if you are not particularly tech savvy. If you do like to tinker, though, and are willing to dive deeper into it, its possibilities are nearly endless. The macros I use range from very simple ones (e.g., launch iTunes every Saturday morning so that certain podcast episodes can get downloaded that are only available for one week; Click on the Load Remote Content button in Apple Mail when I hit a certain keystroke so I don't have to reach for the mouse, etc.) to medium complicated ones like one above, to relatively complex ones (e.g., parse the current note in The Archive for level 1 headings, show me a list of those headings, and then scroll the note to the heading that I have selected; When I hit reply in Apple Mail, fill in "Dear first name, [...] Best, my name, etc.). I also use Keyboard Maestro for text expansion. For instance, when I type ,,cell it inserts my cell phone number, when I type ,,cmd, it inserts the ⌘ symbol, when I type ,,dd, it inserts the current date, just to give you a few examples. Ok, I better stop now. Otherwise, this will turn into a full-blown unpaid advertisement. @jemscott It would, if you create an Automator Service. But the URL encoding requires some extension. I tried the Apple Script Toolbox, extracted into ~/Library/ScriptingAdditions/. 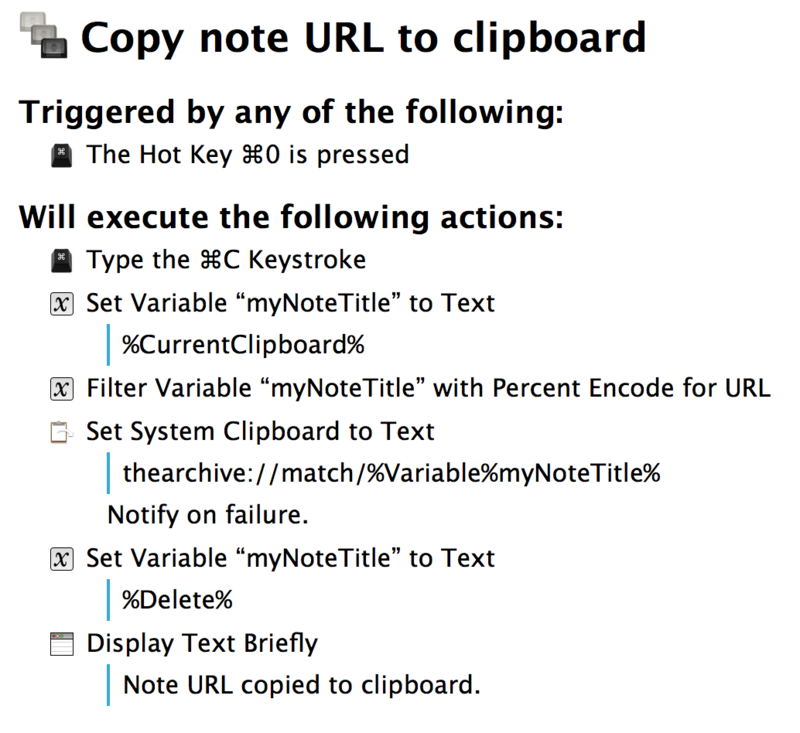 You need to restart Automator afterwards, though, to recognize the new script stuff.